Troy-Bilt has been making mowers for decades. A variety of features are available in the Troy-Bilt lawn mower line up, which consists of about a dozen different models. All the Troy-Bilt decks are stamped steel - cast aluminum decks are not available. The lower cost models are powered by the proven side valve Briggs and Stratton engine which has been around for decades. The higher priced models sport an OHV engine, either manufactured by Honda, Briggs and Stratton, or Kohler. These can be considered as low cost introductory machines for the first time homeowners, up to an upper mid-grade machine for those customers looking for more advanced options. Some of the more expensive features available as options include electric start, variable speed self propel, and front wheel drive. An example of a less expensive model in the lineup is model TB436. 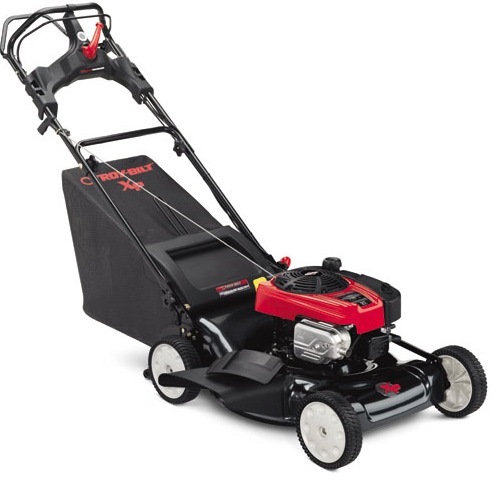 Equipped with a classic side valve Briggs and Stratton engine with a foam air filter and a blade brake, this mower is a good choice when cost is a consideration. An example of a ‘mid range’ Troy-Bilt lawn mower is the model TB566 . The rear wheels are larger in size, helping with rough terrain. Rear wheel variable speed self propel helps to keep the mower moving when the rear grass bag is full. The blade is powered by a Briggs and Stratton engine. . Among the most expensive of the Troy-Bilt mowers is the TB86K XP . This is a rear wheel drive self propel mower that has a variable speed drive. A Kohler OHV engine provides plenty of power to effectively get the job done. Since Troy-Bilt manufactures such a variety of models, a comparison chart is available on their website.